Not long ago, we published the blog post All Washed Up: Putting an End to Self Trading. We’ve since officially released our order-cross prevention functionality on TT, which provides users with the option to transfer a position when two opposing orders within the same group match on price. We’re excited to make this feature available to our users, and we’re already working on enhancements. For example, within a few weeks, we’ll provide the ability to match exchange spreads and synthetically generate the spread and leg fills for each account. As mentioned in my last blog, stay tuned to learn more about this feature as we continue to iterate and roll out new enhancements. In the meantime, feel free to reach out to us to learn more or to schedule a product demo. Or try TT yourself at trade.tt—it only takes a few seconds to create a free demo account. It’s been just over one week since Global Markets Exchange (GMEX) debuted. Connectivity was available at launch through X_TRADER®, and in fact the first trade on GMEX was executed between two X_TRADER users. We’re planning to offer access through the next-generation TT platform later this year. GMEX has launched Euro-denominated IRS constant maturity futures (CMF) in response to demand from end users. These demands arose from changes in the European derivatives markets that were introduced under the European Markets and Infrastructure Regulation (EMIR) and the European Commission’s review of the MiFID II. These futures, positioned as alternatives to OTC interest rate swaps, allow end users to benefit from the capital and margin efficiencies of futures, which are more favorable than the higher margin requirements for cleared swaps. Last week the CFTC issued a report detailing the flash crash experienced in the U.S. Treasury cash and futures markets on October 15. The report highlighted the lack of a “smoking gun” culprit as the cause of the sudden and dramatic price swing witnessed in these markets. Instead, it pointed the finger at a culmination of many factors, including downward pressure on yields leading up to the event combined with an economic data release which contradicted the market’s expectations of a rate increase. It also highlighted another phenomenon prevalent in today’s highly automated markets: self trading. According to the CFTC report, nearly 15% of all transactions were “wash trades” during the period in question, meaning the same person—or two people trading the same account—represented both the buyer and seller on a trade. 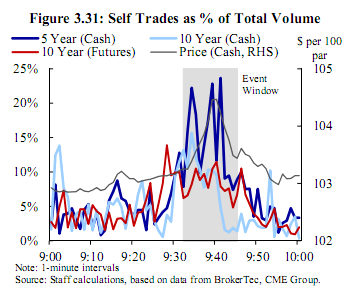 While this is an incredibly high percentage, what is more troubling is the fact that the average daily percentage of self trading on the cash Treasury markets is nearly 6% of all volume according to the agency’s report. Even though wash trading is typically forbidden in futures markets, it is nevertheless a common occurrence as trading systems and strategies grow in complexity and capabilities. Many exchanges have built self-match prevention measures into their matching engines, but they are an “opt-in” feature and are largely considered a blunt instrument trying to solve a more nuanced problem. Self-match prevention is also increasingly under the regulatory microscope due to its role in facilitating spoofing: the assumption goes that if a spoofer is really looking to sell, he or she can put a large bid into the market to encourage other buyers to join and then sell through the level he or she was bidding. This has the effect of creating the necessary size into which the trader can sell while relying on the exchange to safely cancel the resting bid when self-match prevention is enabled.